BOCAUE--Basketball Australia issued an apology for the incident that happened on Sunday during its national team's practice at the Philippine Arena. "We never intended to be disrespectful or to challenge Philippine basketball," said team official Mark Bradtke, who issued the statement on Monday night, just minutes before Australia takes on Gilas in the FIBA World Cup Qualifiers. 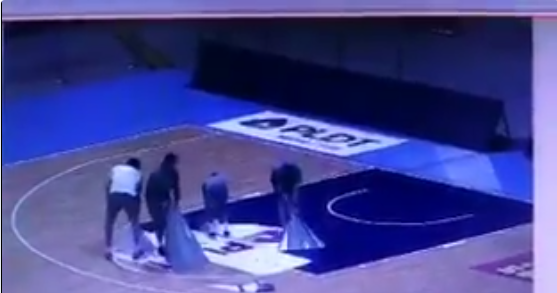 Owing to a slippery surface, the Boomers' staff decided to strip the sticker decals at the free throw circle and the side of the court, which was actually caught on the venue's CCTV. "Our intentions were pure in rectifying what is potentially a player safety issue for all participants. As our loss against Japan showed, it is a very tough competition, and we wanted the best environment for all players whose health and safety are critical," Bradtke explained the said move. However, he clarified, "We wanted... a respectful environment. We are very happy with the new court decals. Our concerns were alleviated." Bradtke then said that he looks forward to improving the basketball-wise relation between Australia and the Philippines after the said incident. "The Philippine Basketball Federation (Samahang Basketbol ng Pilipinas) and the players are our friends and neighbors.... We look forward to using this situation as a building block for basketball to have the best environment for all participants, officials, and friends, and lastly, to maintain our great relation with Philippine basketball," he concluded.